See our new Auto Glass Replacement Gallery! Ron’s Auto Glass serves the Twin Cities of Minneapolis, St. Paul and surrounding Northern suburbs. Vehicles we service include; Cars, Classic Cars, Station Wagons, Muscle Cars, Hot Rods, Pick-up Trucks, Heavy Duty Trucks, Vans, SUV’s, Semi’s, Buses, Motorhomes and RV’s and Commercial Vehicles.. 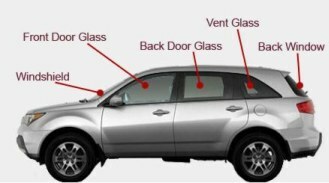 Vehicle parts we replace include; windshields, door glasses, vent glasses, quarter glasses, back glasses (heated and non-heated) door mirrors, rearview mirrors and windshield wipers. We can also help you locate hard to find glass for your classic car. We work with new and used auto glass and will install your own vehicle glass too. Ron’s Auto Glass is a mobile auto glass service that comes to you at your home, business, place of employment, shopping mall, body shop, auto service shop or just about any location within our extensive service area. Normal business hours are Monday through Friday 8:00 AM til 5:00 PM. Saturdays are by appointment only. If you have a glass replacement emergency, please call and we may be able to accommodate your needs. Ron’s Auto Glass works with all types of Vehicle Insurance Companies. Don’t have car insurance? No problem! We accept cash and checks too.